Hi friends! 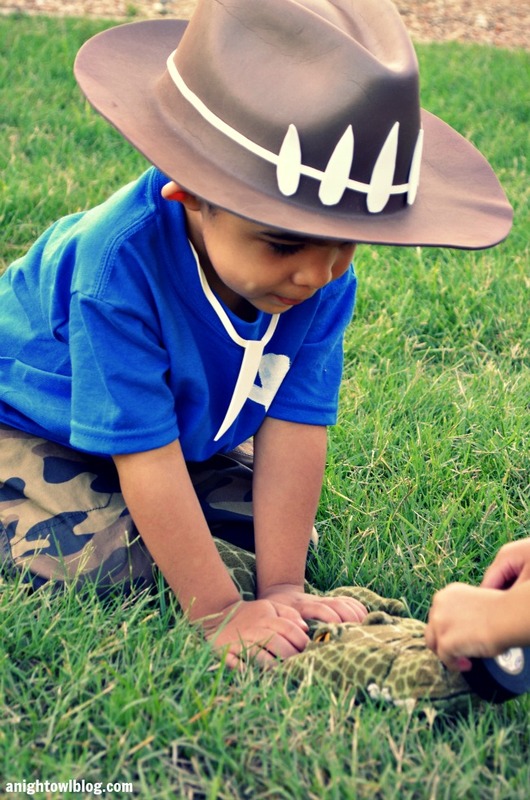 Today we’re talking homemade Halloween costumes! 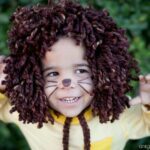 If you’re thinking of making costumes for your kids this year, it’s time to get crackin! 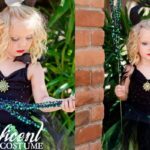 I’m teaming up with Jamie from C.R.A.F.T and Really Awesome Costumes for the Really Awesome Handamde Costume Series – four weeks of new handmade costume fun! Nothing too fancy to work out here. 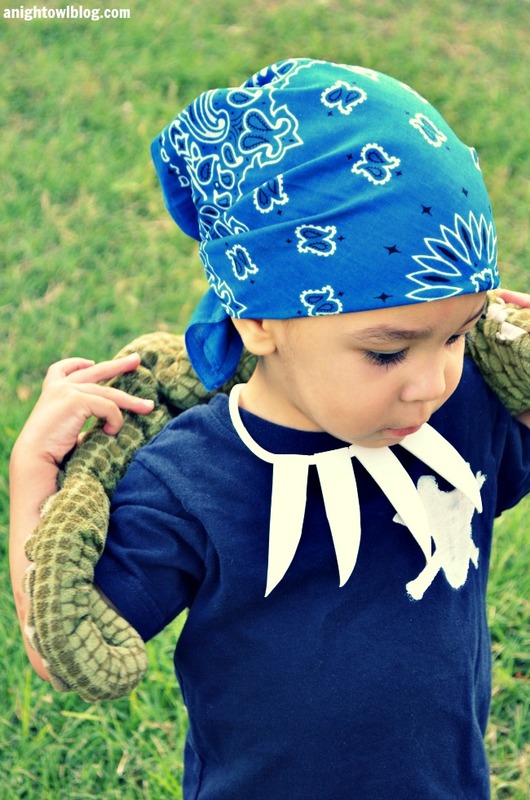 Grab some camo pants, blue shirts, a bandana, a hat, alligator teeth necklaces, and an alligator of course – and you’re good to go! There are a few handmade items I’ll show you. 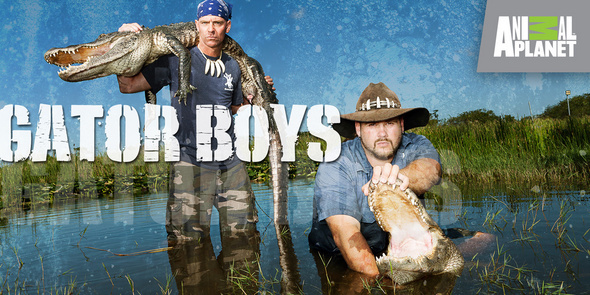 First up, the Gator Boys have an alligator skull logo on their shirts. 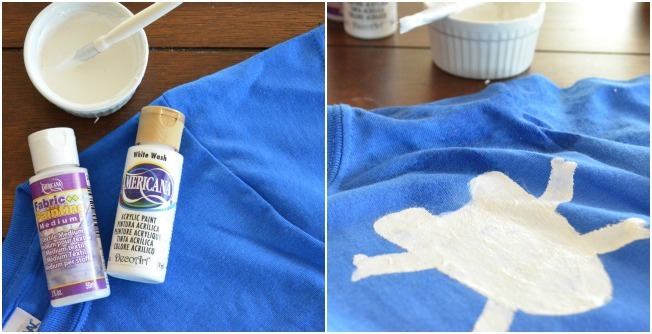 To keep it simple, I mixed DecoArt white acrylic paint with DecoArt fabric medium and painted a similar shape on each t-shirt. 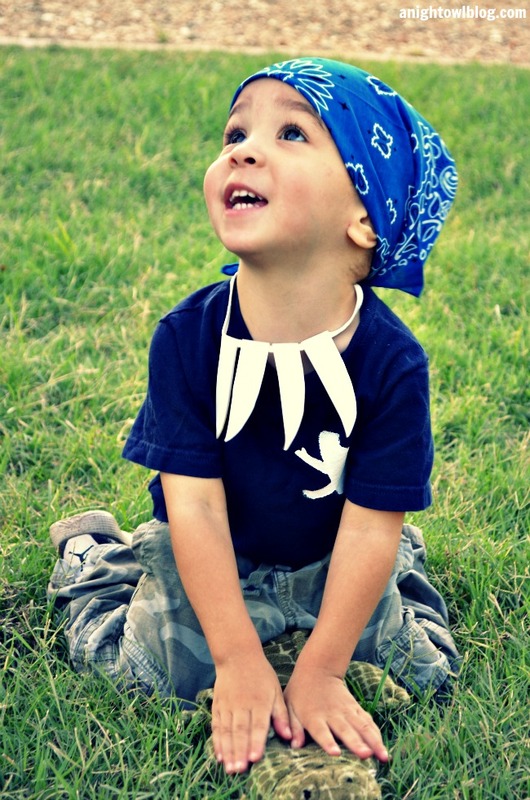 Next up I wanted to make fake alligator teeth necklaces and the hat. 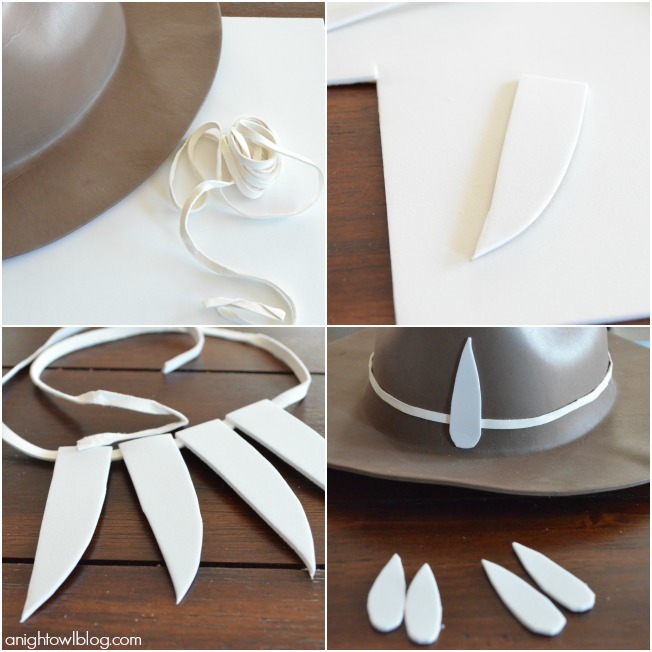 From my local craft store I grabbed a foam cowboy hat, an adhesive-backed white foam sheet and white cording. For the necklaces, I simply cut out alligator shaped teeth, and peeled back the adhesive on the top backside of the teeth to adhere to the cording to make a couple of necklaces. Super easy. Then for the hat, I glued a length of cord around the hat and added more alligator teeth on top by just peeling back the adhesive. Each project only took minutes and just a few dollars. Perfect! And the finished result is just so much fun! The kids knew exactly who they were and what they were doing. 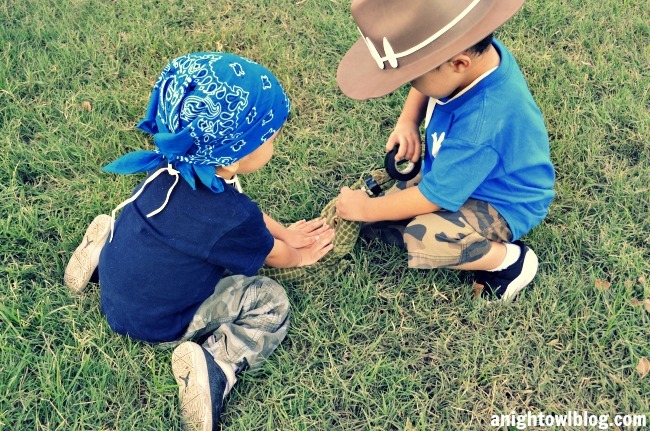 We had fun taking pictures, and the boys were literally mimicking what they see on the show. 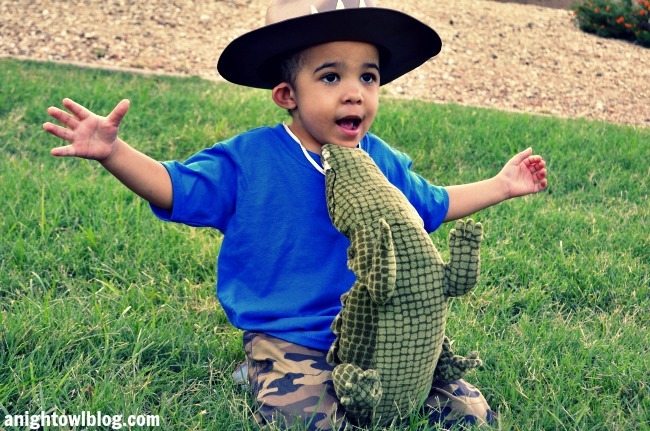 I guess we’re going to have to watch them closely if we’re ever around real alligators! Haha! Sorry for the picture overload, we just had so much fun! 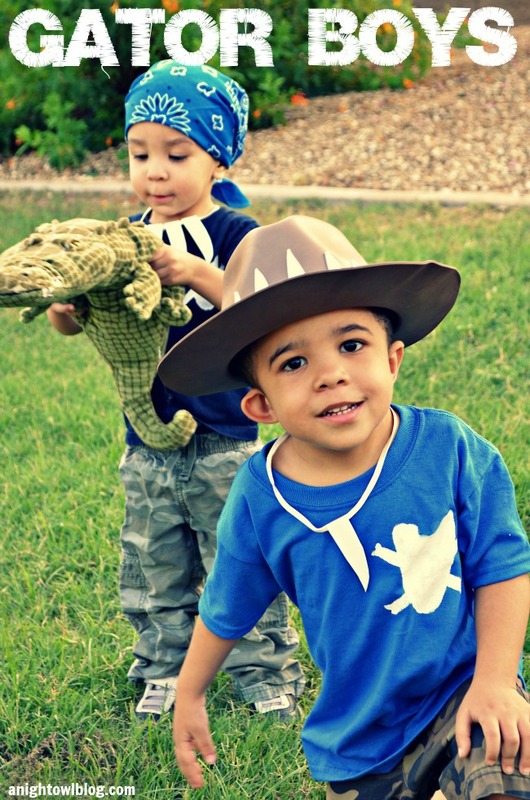 So what do you think of our Gator Boys Homemade Halloween Costumes? They’re perfect for our little animal-loving guys. What are your kids into right now? What are you thinking they’ll be for Halloween? I’d love to hear! 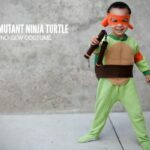 If you still need some homemade Halloween costumes inspiration, make sure you head over to Really Awesome Costumes for daily ideas and for features from the Really Awesome Handamde Costume Series! Also be sure to check out all of our Halloween projects, including 25 Halloween Decor Ideas we just shared this week! 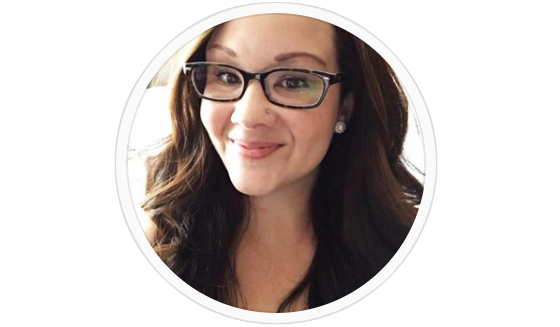 So excited this holiday season is well on its way! Happy Fall and Halloween crafting friends! Your boys are adorable! I love all the pictures. 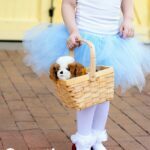 What a cute and fun costume! So stinkin’ cute! And I bet your boys are SO happy to be Gator Boys! Thanks for participating in the Really Awesome Handmade Costume Series! Your boys are super adorable!! The costumes are so cute!! 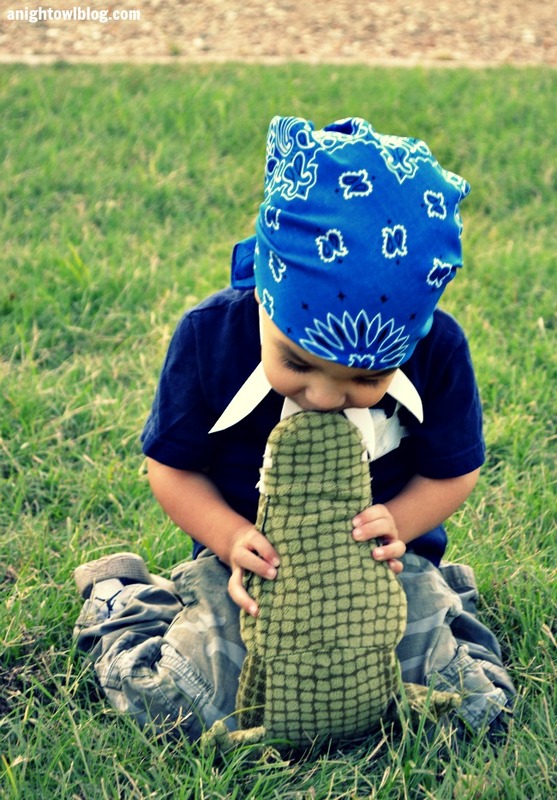 I love the pics when they have the stuffed gator under their chin. So cute!! This is awesome. 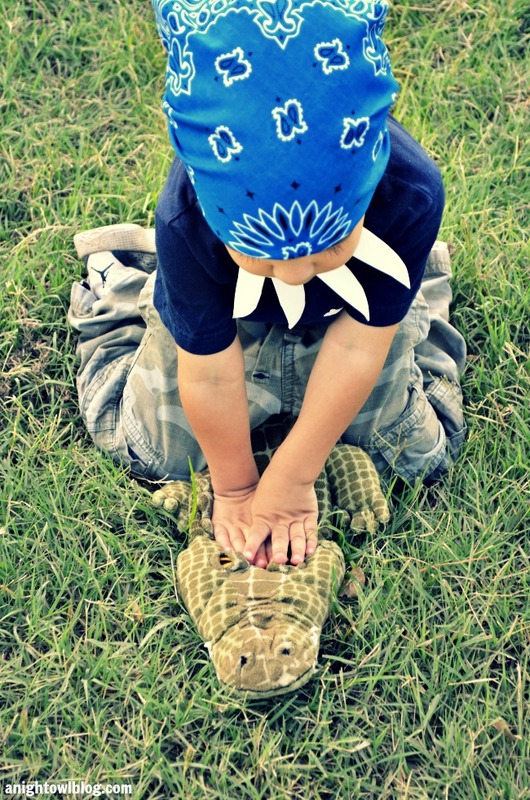 My 4 yo also wants to be a Gator Boy for Halloweesn so I’m following your blueprint. Thanks! Oh how exciting Mary Beth! You’ll have to share a picture with us! Hehe, right Maureen? 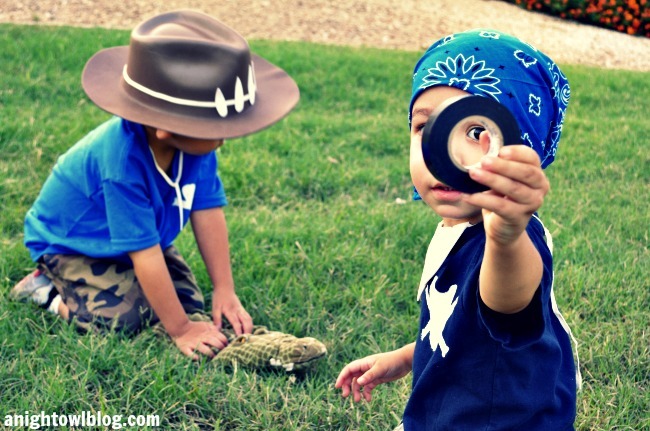 It was such a fun project and my boys just loved it. And it was pretty easy, even better right? I love the dog as a gator idea. We have a weenie mix, so we might just have to try that as well!